a Beneteau 50 sailing yacht, leaving out of Brewer Yacht Yard Greenport Harbor on the North Fork of Long Island NY, for one of many choices of sailing cruises. Whether you choose to spend a full day, charter a half day, sunset cruise overnight, custom charter or entertain valued clients, your experience is certain to leave you with lasting memories. Sit back & relax, let the wind guide you on your journey from Greenport around the North Fork to Shelter Island, The Hamptons, Montauk, New England, Block Island and beyond. With a skippered yacht charter all you need to do is enjoy. 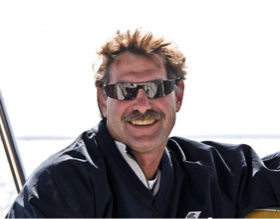 Captain Ron has been sailing on the East Coast for over 30 years, traveling from New York to South Carolina. Ron is a licensed United States Coast Guard Captain.